Don't Count Time, Make Time Count! Tick…tick…tick…can't find enough time? Find out how to use it far more wisely by the man who successfully runs multiple business ventures simultaneously. 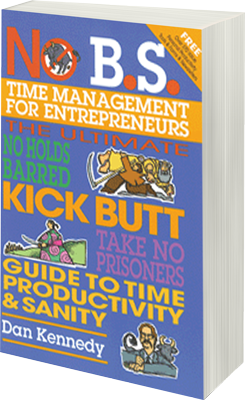 Dan Kennedy has been called the "Professor of Harsh Reality" because he doesn't deal in glib, pabulum solutions and eye-rolling cliches you've heard incessantly on time management. He takes on the world of cell phones, PDA's, faxes, emails and every other communications device that pervades our life, suggesting when to tap it and when to give it the heave-ho. This entrepreneur-consultant-author-speaker has a whirlwind business life, yet manages to fit everything in using a handful of home-brewed time tools he swears by.